Hello, Frank Indiviglio here. Please see Part I of this article for information on the natural history of the clownfishes and their close relatives, the damselfishes. Today we’ll take a look at the most popularly kept of the clownfishes, the beautifully-colored Percula clownfish, Amphiprion ocellaris. Even before being skyrocketed to fame by the movie Finding Nemo, the Percula was an aquarium favorite, and one of the most widely-recognized marine fishes in the world. Its brilliant orange and white coloration and seemingly “comic” mode of swimming endears it to all. Hailing from the Indo-Pacific region (western Pacific and eastern Indian Oceans, including the Great Barrier Reef), this clownfish reaches a length of 3.2 inches in captivity; wild specimens are reported to exceed 4 inches in length, but captive bred animals are generally smaller. Observations of free living Percula clowns indicate that they usually colonize magnificent sea anemones, Heteractis magnifica. I have not read any research indicating that the various clownfishes seek out host anemones based upon their ability to survive within a particular species (please see Part I), but such would certainly be interesting to investigate. Please note: Maldive Clownfishes are pictured here with a Magnificent Sea Anemone. Like all clownfishes, the Percula is territorial and quite protective of the anemone in which it lives. Generally only one mated pair can be maintained in an aquarium, unless it is very large and well stocked with coral and other sight barriers. Percula Clowns are omnivorous, and accept a wide variety of dry, frozen and live foods. A mix of vegetable-based and meaty items should be provided. Fortunately, captive bred specimens are readily available. If considering a Percula Clownfish, please be sure to select a captive bred animal. in the wild….there, clownfishes deprived of an anemone’s protection are quickly consumed by predators. However, they are at their best when displayed with a living anemone, and when kept so will reveal a great many of their interesting interactions with these invertebrates (please see Part I of this article for further information). The keeping of live sea anemones differs somewhat from fish-keeping. For further information, please see the following articles on our blog: Unusual Invertebrates for marine Aquariums and Anemone Movement: Common Aquarium Questions . Please check out the book I’ve written on marine and fresh water aquariums: The Everything Aquarium Book. You can learn about clownfish natural history here. Hello, Frank Indiviglio here. Damselfishes and Clownfishes are closely related, with all 325+ species being classified in the Family Pomacentridae. Among the most numerous and conspicuous fish on tropical coral reefs, a number make hardy marine aquarium inhabitants. Damselfishes and Clownfishes are found throughout the world’s tropical and semitropical seas, with the greatest diversity occurring in the Indo-Pacific Region, especially off Australia; relatively few occur in the Atlantic and Eastern Pacific Oceans. They occupy a startling variety of habitats, with many species restricted to specific depths or specific areas of wave action. Several species can even enter brackish waters. Identification in both the wild and pet trade is sometimes difficult, as their colors often vary from individual to individual; different populations of the same species may also exhibit unique color patterns. Clownfishes (aka anemonefishes) are well-known for their habit of living in close association with an invertebrate that is also an aquarium favorite, the sea anemone. Usually home to just one pair of clown fish, the host anemone forms the basis of their territory, and they rarely stray far from it. Clownfishes were long thought to be immune to the anemone’s stinging tentacles, as they shelter right among them without being harmed (other small fishes would be killed if they attempted to do this). We now know, however, that the clownfish’s secret is not immunity at all, but an even more amazing adaptation. Anemone tentacles fire their sting-bearing cells (nematocysts) upon contact with any organism that they come in contact with. The tentacles are coated with mucus which inhibits them from stinging one another. It seems that the clownfish secretes mucus which mimics that covering the tentacles of the anemone. Therefore, the anemone simply does not recognize the clownfish as prey, or even as a distinct organism! In return for the protection offered by its host, the clownfish consumes parasites that might harm the anemone. By swimming about and fanning its fins, the clownfish may also increase the flow of oxygenated water through the anemone’s tentacles and about its base. 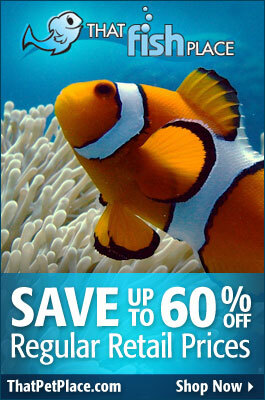 Do Anemones and Clownfishes “Need” One Another? Aquarists often question whether clownfishes and anemones can survive without one other. It appears that the relationship might the best be described as “commensal”. By this we mean that each derives benefits from living in close association with the other, but they are not strictly limited to that situation. The vast majority of anemones live without clownfishes. Clownfishes, however, seem somewhat more dependent upon the relationship. While they will live quite well “on their own” in the aquarium, experiments in the wild have shown that clownfishes without anemone hosts are quickly eaten by larger fishes. The Florida Museum of Natural History has posted an interesting article and video on clownfishes here. Next time we’ll take a closer look at the damselfishes and a favorite aquarium clownfish.